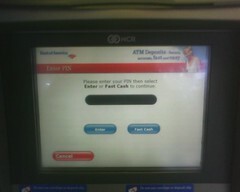 And, again as usual, I entered my PIN, pressed “Fast Cash”, and waited. After a few seconds, the machine didn’t seem to be doing anything, so I pressed “Fast Cash” again. …it just as quickly disappeared, and the machine told me it was processing a transaction. Have you caught onto what happened yet? That’s right. Both presses had registered, even though there was no sign that the first had even been accepted— and the second had registered with the machine as pressing the “$100” button, which just happened to take up the entire space used by the “Fast Cash” button on the previous screen. 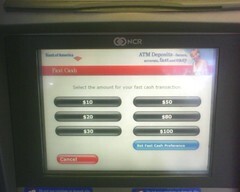 And thus, because of bad user interface design, I withdrew $80 more than I had intended to. Edited 2008/11/09 to add: I was just thinking about another thing with these ATMs. Normally these machines beep when one of the on-screen buttons is pressed, to indicate that the button press has gone through, even when the screen doesn’t immediately update. I don’t recall hearing that from the ATM I was using at the time of this incident, however; either that, or it beeped but the sound was inaudible over all the din from downtown. And of course, an aural response still doesn’t solve the issue for deaf people. Is it that difficult to put up a “Please wait; processing…” message to make sure nobody inputs anything unintended? 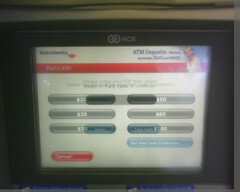 I miss the old ATMs. The green console text on black was nostalgic and more importantly, responsive! I also like real buttons; pretty UIs and touch-sensitivity can be way overrated.